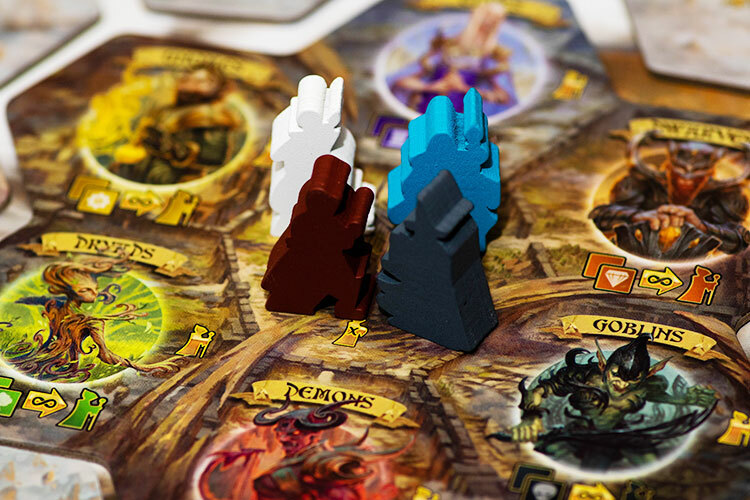 We review Archmage, a great looking action selection and area control board game published by Starling Games. 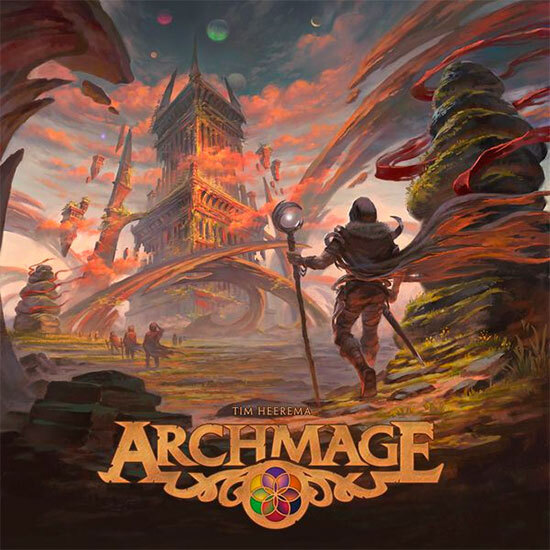 In Archmage, players are exploring an old city trying to collect ancient relics. Have you ever wanted to be a wizard? Obviously, yes. Well in this fantasy world you’ll have to acquire relics from the mythical races of dwarves, elves, goblins, and others and trade them for knowledge of their magical powers. Archmage promises to be a game of exploring the ruined city and training your mage, using your acquired knowledge and fighting for control of the fantasy kingdom. How well does it deliver? Let’s find out. 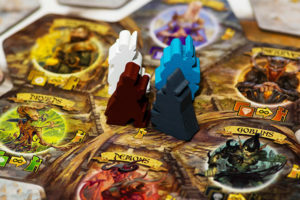 Archmage is an area control and action selection game for 1-4 players. It plays in about 90 minutes. In Archmage, each player is attempting to restore magical knowledge after the city has been left in ruins. Players explore the buildings, discovering locations of the mythic races, and gathering relics of their magical power. These relics allow players to train disciples in that discipline and give them access to a spellbook that can be used to perform powerful abilities. Mages start at the cursed tower and explore out from there. The hex-based map is the center of the game. Each turn you have movement points that can be spent moving your mage, having them attack an opponent’s disciple, and deploying your own disciples along the way. Most of the hexes are wilderness tiles that correspond to a certain type of relic for each mythic race. The libraries, for instance, will grant you relics that can be taken to the elves to learn time magic. Your own mage’s tower allowing you to test apprentices against each other to improve their abilities. 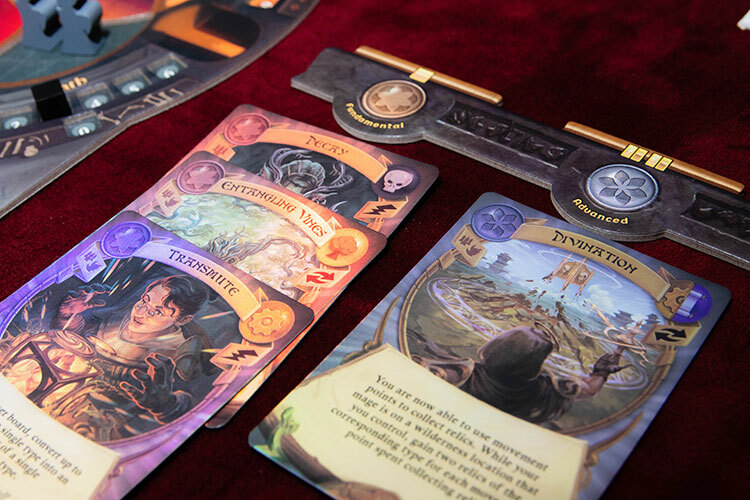 Each player has a board that shows where the magical factions can intersect. Having apprentices in both blood and death magic, for instance, can allow you to “battle” against each other. One will return to your supply and the other will carry forward to knowing a more powerful spell that combines both schools of magic. This continues potentially to a master level spell that requires three different schools of magic. The game continues for a set number of rounds and then final scoring takes place. Each mage scores points for the spells they have available. In addition, at the end of your final turn you score points if you have control of the majority of each type of wilderness tile on the map, i.e. most libraries. 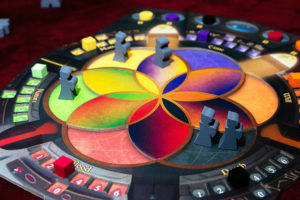 Every player scores separately at the end of their final turn, however, so it’s possible for every player to score points for having the most libraries as play continues normally after each player scores their end game points. Players will quickly spread out and explore the wilderness tiles. Archmage is really more of a resource management game than you might think taking a look at the game on the table. 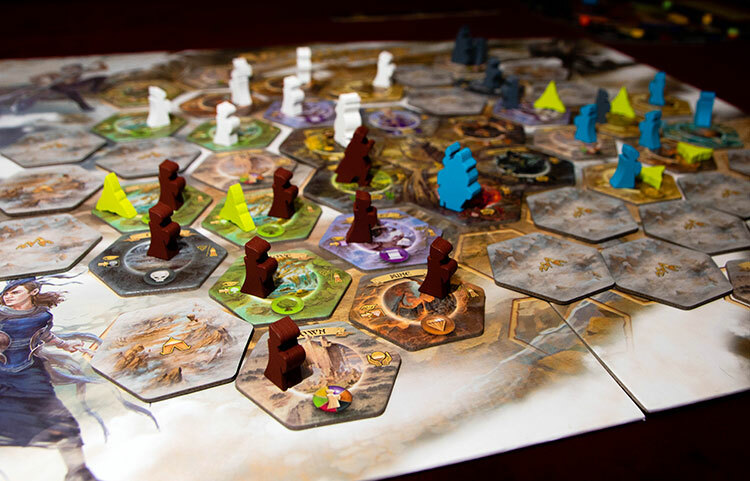 The large hexagonal map and huge number of wooden follower and mage meeples look a lot like an area control game. In fact, there is an element of area control in the final scoring, as we already discussed. But my biggest disappointment in Archmage is how little the map really seems to matter. The game starts with most positions on the map face down and mages will discover hexes to get the game going. Doing so nets you additional relics for that race and is kind of a fun element as the map starts appearing based on the players’ actions. However this only lasts a few rounds as the entire map gets mostly explored within the first handful of turns. Having five movement points each turn means you can easily remove opponent’s followers from any hex in your way. It only costs one movement point to remove a follower in the hex your mage is in. And players cannot place more than one follower in each hex. There are a few spells you can use to slow down your opponent’s movement, but largely it is difficult to hold and maintain position of any particular hexes throughout the game. 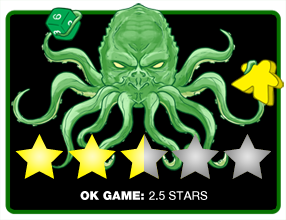 The followers on your player board reflect the schools of magic you have knowledge in. In reality, you need to plan out grabbing a few hexes and cashing them in for relics as soon as possible. Activating towns can be a boon if you are able to do so after taking over a handful of nearby wildernesses as it will activate all of the tiles you control. Once you’ve got those relics, you visit the mythic races and your own mage tower to train and upgrade your followers into powerful magicians. But as quickly as you grab those positions, your opponents will run over and take them back. If you spend one of your limited turns putting out protective wards you can make your opponent waste one of their movement points to remove it before they can remove your follower, but you are essentially giving up an entire main action to force your opponent to use one-fifth of their allotted movement points during their turn. Most of the points you get throughout the game relate to these apprentices and the spells they give you access to. It’s largely best to focus on 3 or 4 of the schools of magic and train and upgrade as many apprentices as possible as master level spells are worth four points each at the end of the game. Your spellbook is available based on the training your followers have received. It’s important to note that you have to consider if it makes sense to upgrade your apprentices into middle-management mages throughout the game as you may lose access to the lower level spells. There is definitely a trade-off you have to make between a few powerful spells or a variety of less useful ones. Once the map is explored, the rounds feel like they just continue to repeat themselves. I’ll move my mage a few steps, knock out some opponent’s followers on my way, and end at a town to collect relics. Then I’ll go to the mythic races’ enclaves and train some followers. Then I’ll go to my mage tower and have some battle and upgrade them. Rinse. Repeat. When the game ends, the area control scoring can make a big difference, but feels entirely unsatisfying. The fact that each player scores the majority for each tile type at the end of their turn feels unnatural and makes the end of the game disjointed. How can both my opponent and I succeed at being the favored mage of the Dwarven clan? Mechanically it makes sense, and it probably necessary since we’ve discussed how easy it is for tiles to change control easily, but it makes for quite the let down at the end. In fact, throughout every play the only time I’ve even started to consider which majorities I am or am not winning is the last turn or two. It’s just not something you can do early and protect in any meaningful way. Archmage is a beautiful package and a lot of good ideas but is badly in need of a different victory condition. Perhaps just scoring the spellbook would have made the game a more cohesive experience. I think the spellbook mechanism is an ingenious idea and hope it gets explored further. The exploration part of the game, similarly, is fun as you make tactical decisions based on where and how the map is revealed. It’s just disappointing it takes only a couple of rounds for this portion of the game to complete and the tedious gathering of resources and hexes takes over. There is an upcoming expansion for Archmage in the works and perhaps it will flesh out a bit more in the way of fighting for area control that will enrich the entire experience. As the game currently sits, it’s a neat experience but a forgettable one. Final Score: 2.5 Stars – A great looking game where the exploration ends too fast and the scoring mechanisms let down the entire experience.